Before her mother died, Cate promised to protect her sisters. But with six months to choose between marriage and the Sisterhood, she might not be able to keep her word...especially after she finds her mother's diary, uncovering a secret that could spell her family's destruction. Desperate to find alternatives to their fate, Cate starts scouring banned books and questioning rebellious new friends, all while juggling tea parties, shocking marriage proposals, and a forbidden romance with the completely unsuitable Finn Belastra. 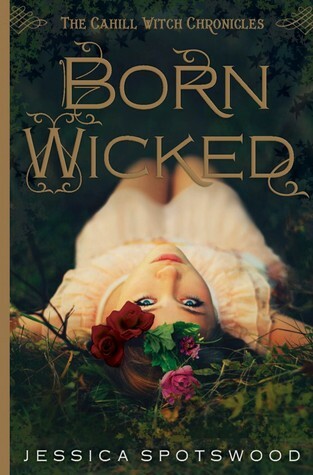 I’ve been looking forward to Born Wicked since the moment I laid eyes on the cover and read the synopsis several months ago, and I’m happy to say it didn’t disappoint. This book was filled with compelling, realistic characters. Cate Cahill is strong and independent with a fierce spirit under her quiet demeanor. She loves her sisters - feisty Maura, who is desperate for some independence and attention, and sweet Tess who is capable of so much more than anyone imagined - and would do anything to protect them and keep them and their secret safe. Everything Cate did was for them, always keeping their best interests and well-being in mind. I was amazed by her maturity and her willingness to sacrifice her own happiness if it meant keeping her sisters happy and safe. Then there’s Finn. Sweet, kind Finn, with his ginger hair and cinnamon freckles and glasses and bookworminess. *sigh* Finn loves his family as much as Cate loves hers. He accepts her exactly the way she is, and doesn’t expect anything of her the way everyone else does. The forbidden romance between them was so achingly sweet and realistic. I always looked forward to their encounters. The Brotherhood made me so angry! They were ignorant and hypocritical, and what’s most upsetting of all is that you know these things happened in history. People were accused of witchcraft for the least little thing and were hanged or burned or stoned or sent to insane asylums or prison ships. The way they were portrayed felt spot-on to me - pious, with calm demeanors, but this hidden anger and hatred toward women underneath. The story had this underlying sense of danger and suspense throughout. I didn’t know who to trust through the entire book, and found myself guessing and wondering at what would happen next. Would someone betray Cate and the sisters, or turn out to be an ally? Was someone secretly a witch? Would the sisters get caught? It was very exciting, and the tension really propelled the story forward. Overall, I thought Born Wicked was a fantastic debut that was beautifully written in a quiet, almost understated way. I’m anxious to find out what happens in the next book, Star Cursed - I just wish we didn’t have to wait until next year! Have you read Born Wicked? What did you think? If you haven’t read it, do you plan to? EEP Can't believe I still haven't read this book dude!!! It sounds so cool!! Great review Marie baby! !